Home » Uncategorized » Can your thyroid be the reason you can’t lose weight? This entry was posted in Uncategorized and tagged durham naturopath uxbridge on May 22, 2018 by dk. Did you know that a tiny, butterfly shaped gland nestled in your throat is responsible for producing and regulating some of the most important hormones in your body? This mighty gland is called the thyroid, and while it’s relatively small in size, it plays a large role in our endocrine (hormone) system. The thyroid gland produces hormones that interact with many other hormones (like insulin, cortisol, estrogen, progesterone, and testosterone). We’re still learning so much about how the endocrine system works, but looking at how intimately all hormones communicate with each other, it’s no wonder so many symptoms and diseases are tied to a poorly performing thyroid! Almost all of the hormones the thyroid produces are in an inactive form called thyroxine, or T4. Most of the active thyroid hormone, triiodothyronine (or T3), comes from the conversion of T4 to T3 in different areas of the body, including liver, gut, brain and muscles. The “active” T3 is then able to regulate many function in the body including energy production and regulation of metabolism. When all systems in the body are working well, the right amounts of T4 and T3 are produced. But if something is negatively affecting the thyroid or other organ systems in the body, this hormone balance gets disrupted and we start to experience various symptoms. Some of the factors that impact a healthy functioning thyroid are; nutritional imbalances, toxins, allergens, infections, and stress. All of these can all be problematic to the proper function of the thyroid, leading to dysfunction of the gland, and potentially to wider spread systemic disease. What happens when the thyroid can’t function normally? When the thyroid is compromised, the body is unable to produce or convert the right amounts of thyroid hormones. Consequently, we experience disorders such as hypothyroidism, hyperthyroidism, and thyroid cancer. In fact, thyroid diseases are highly prevalent in North America with an estimated 20 million Americans and 1 in every 10 Canadians having some form of thyroid disease, and over 12% of Americans developing a thyroid condition during their lifetime. Because thyroid conditions are tied to so many varying symptoms, up to 60% of people with thyroid disease are unaware of their condition, with women being 5-8x more likely to affected than men. It is estimated that one in eight women will suffer from a thyroid disorder during her lifetime. Thyroid disease or poor thyroid function is tied to many less obvious disorders including acne, autoimmune diseases, eczema, fibromyalgia, gum disease, irritable bowel syndrome, and infertility. 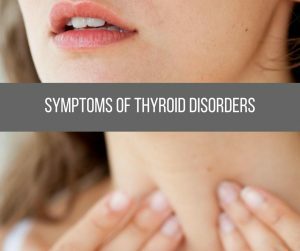 Because the thyroid is linked to almost every bodily function, symptoms of an underlying thyroid problem are wide and varied, making it more difficult to identify the thyroid as the root cause of the disorders. As a result, many people are misdiagnosed and treated for other conditions before looking at the thyroid. A number of symptoms often point to an underactive thyroid, which is the basis of hypothyroidism. Lethargy or fatigue, foggy thinking, depression, weight gain even if you’ve been exercising and eating well consistently, persistently rough/scaly skin and/or dry/tangled hair that are unresponsive to treatments, hair loss (particularly in women), sensitivity to cold, an inability to warm up in a sauna or to sweat during exercise, and a consistently low basal body temperature. Some symptoms of hyperthyroidism include feeling restless, nervous, or emotional, poor sleep quality, fatigue, muscle weakness, difficulty concentrating, frequent bowel movements, disappearance of or irregular menstruation, weight loss, rapid, forceful, or irregular heartbeat, eye problems (associated with Graves’ disease) or swollen thyroid/goitre. Given that the thyroid is so deeply important to overall health, whether you have an obvious thyroid dysfunction or not, it’s imperative to understand how the thyroid works so that you can keep your endocrine system and your body functioning optimally. Thankfully, you can help maintain your thyroid health naturally! When it comes to managing the optimal function of your hormones, the building blocks are almost always found in nutrition first. Go gluten and dairy free: Most people go gluten and dairy free only when there is an obvious sensitivity to either type of food. Sensitivity to gluten and dairy is much more subtle when it comes to the thyroid and often goes unnoticed. The inflammation caused by these foods can lead to leaky gut syndrome which can cause the body to accidentally attack the thyroid instead of the food particles it’s trying to destroy. Removing these foods can be critical to maintain good thyroid health, especially if there is an autoimmune issue..
Say goodbye to unfermented soy: The proteins in soy can be potent anti-thyroid agents that can heavily affect thyroid function. Be extra careful with baby formula too. The consumption of soy formula has been linked to autoimmune thyroid disease in infants. This doesn’t mean that all soy is off the table. You can keep enjoying fermented soy foods like natto, miso, and tempeh. It’s the unfermented soy products like soy milk, and soy cheese that should be avoided. Focus on your iodine level: Iodine is present in almost every organ and tissue and has a direct effect on the thyroid. Iodine might just be the most important part of your thyroid health as our diet and environment make maintaining dietary iodine levels difficult. Chemical agents in commercial food ingredients have the side effect of lessening iodine. Daily exposure to chemicals found in water such as bromine, fluorine, chlorine all negatively impact iodine levels by attaching themselves to iodine receptors in the body. You can see why focusing on consuming enough of this nutrient is so important. Seek out foods containing zinc and selenium: Zinc and selenium are two micronutrients that play critical roles in thyroid health. Because they can be toxic in very high doses, it’s best to achieve healthy levels through diet. Zinc-rich foods include: oysters, beef, pork, and chicken while selenium rich foods include: brazil nuts, fish, and liver. Manage stress: Stress and hormone health are inextricably linked. Make sure you’re taking time to meditate, relieve stress, and get your mindset on track so you can enjoy the benefits of overall health. You can gain control over your health by learning how to manage and maintain your hormones through nutrition, lifestyle, and medical support. If you’re dealing with, or suspect you have, thyroid issues, please take time to book an appointment to visit call 905-852-7969 or email [email protected]. I want to help you take control of your health! Testing and comprehensive hormonal assessments are available. The information presented here does not replace your relationship with your doctor or other qualified healthcare professional. The information is for your general use, so be sure to talk to a qualified healthcare professional before making medical decisions or if you have questions about your health. If you have a health concern, be sure to seek qualified assistance or book an appointment with your healthcare provider.